Suddenly, the season switches. One week ago we had rain and wind; now we bask in hot sun, wondering how we ever survived the winter. We’re back in the city now and here people are in shorts and vests, risking sunburn as pale skin is exposed for the first time in seven months. Thoughts turn to warm weather food and last night’s pork chop came with couscous instead of potatoes. 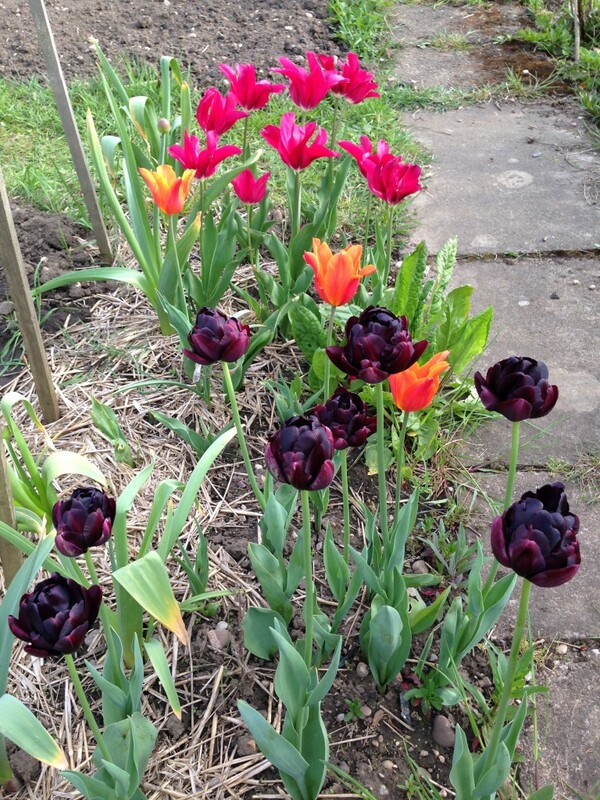 The tulips are magnificent in the sun, pops of colour against brown earth. 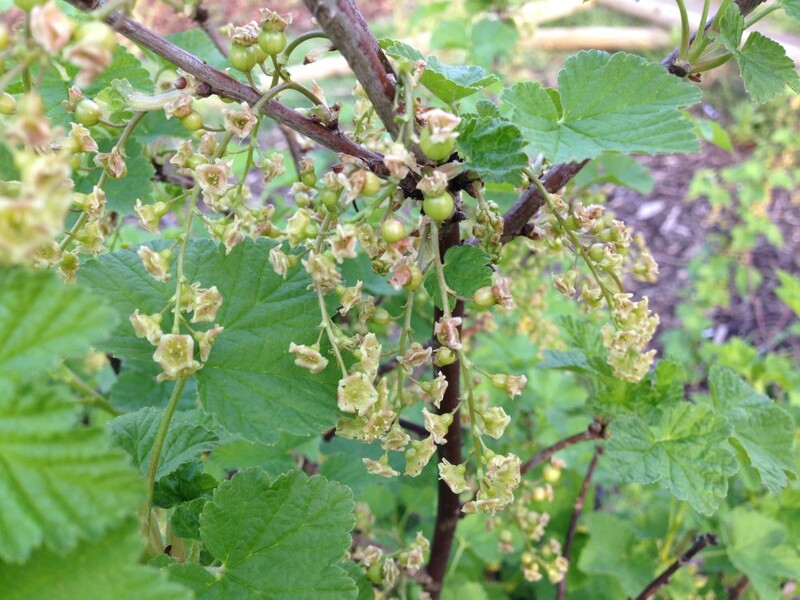 Over in the fruit patch, tiny red currants are setting fruit and the black currants and blueberries are covered in blossom. 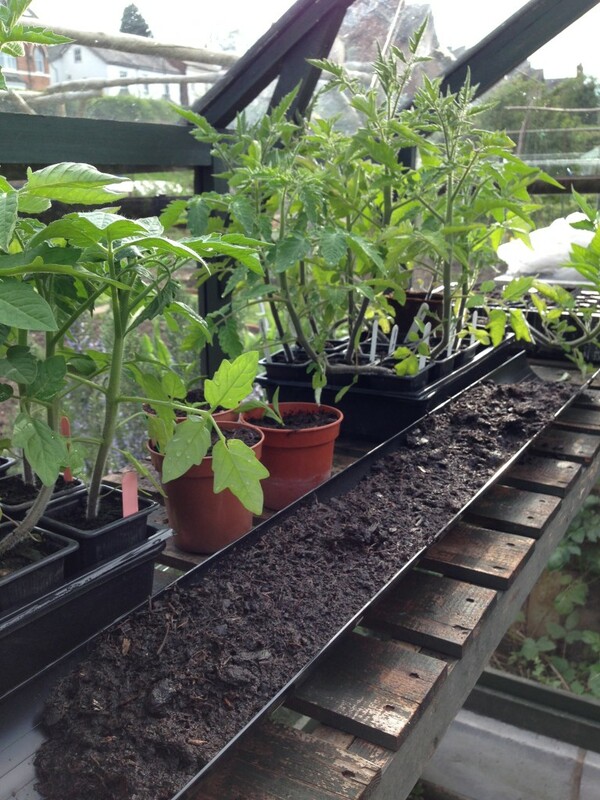 And in the greenhouse, the tomatoes are flying up, now about 1 foot tall. But surely this is a false summer? I’m still prepared for a return to the chill… but having said that, I am brave enough to remove the fleece from the lettuce and brassica seedlings. 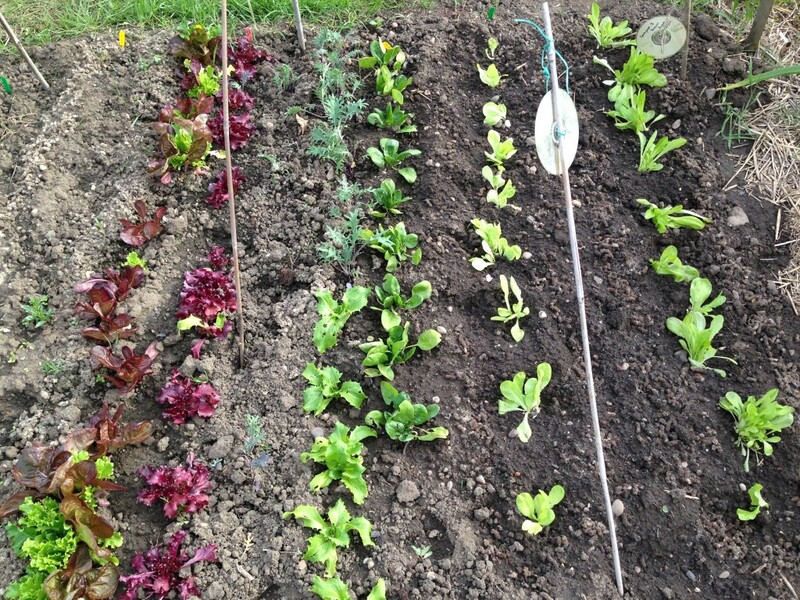 The salad greens are looking like actual plants now and – touch wood – have not been attacked by the slug, so it seems that the expensive wool pellet protection seems to actually work. The carrots and beets haven’t done so well: the seeds sown a month or so ago didn’t take in the cold weather (I never learn) so in go a few more rows. But the important business of the day is the hopolisk. 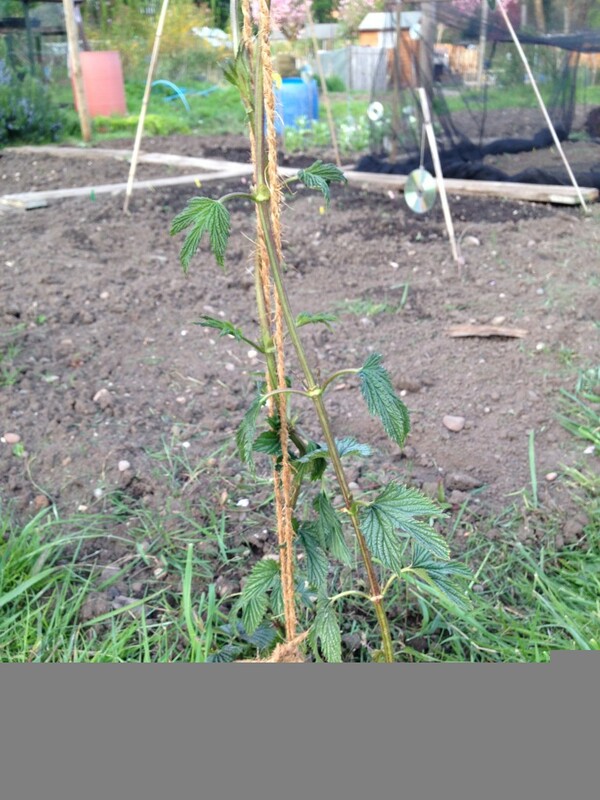 The young hop shoots have shot up in the past few weeks, now reaching to my hip, and without any support are being snapped in the wind. 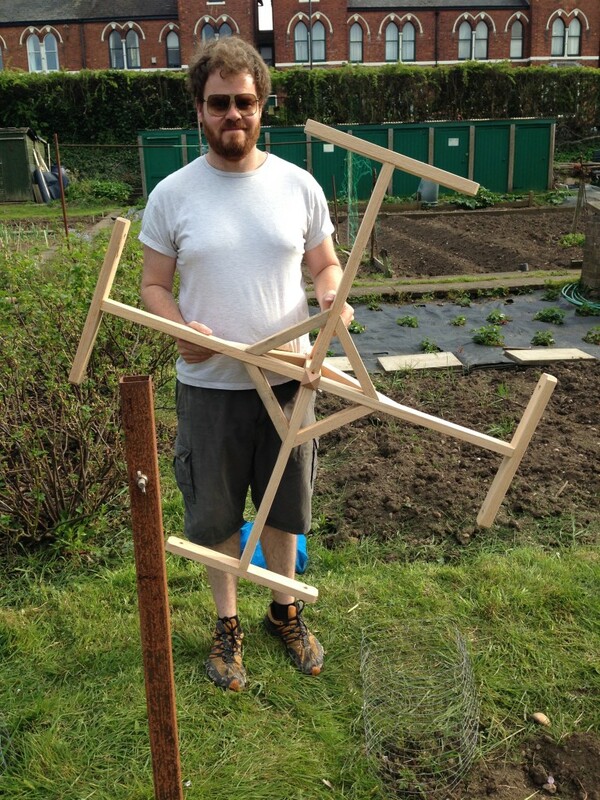 Matt’s devised a new top for the hopolisk this year to better cope with the increased weight of the bines as the plants mature. He arrived clutching his creation like a proud father and, granted, it is a beautiful thing. 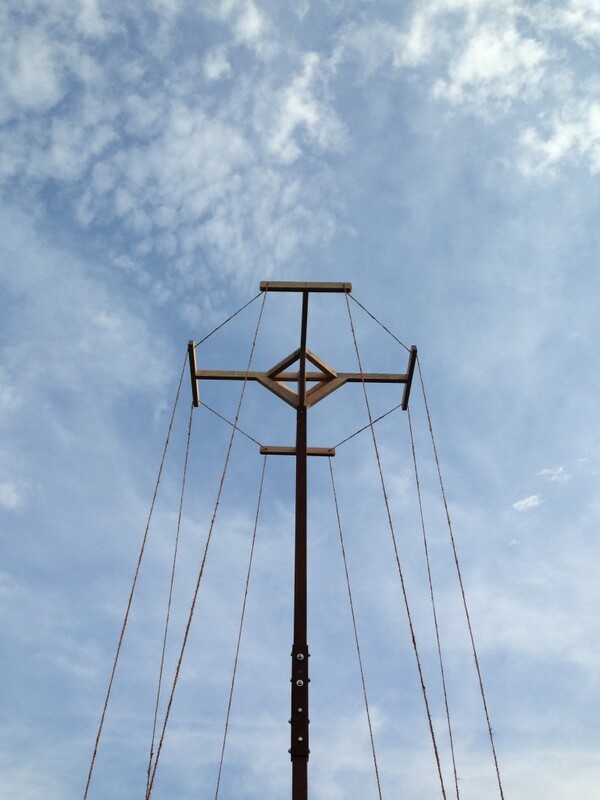 The top is attached to the top of the hop-pole and then tied with proper hop twine, a sturdy old-fashioned rope that comes in enormous balls. 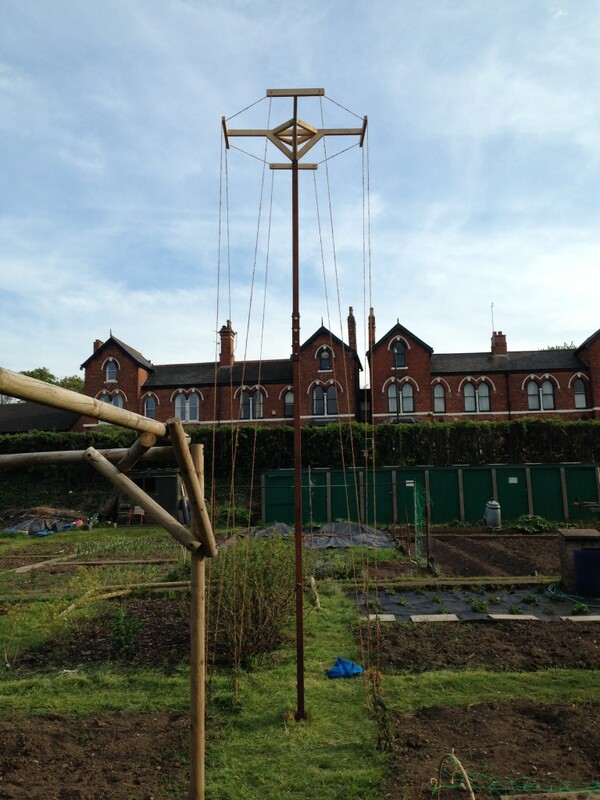 A few minutes later and up the hopolisk goes, like a 5-metre tall allotment may pole. I’ve made my own creations too, albeit less showy. 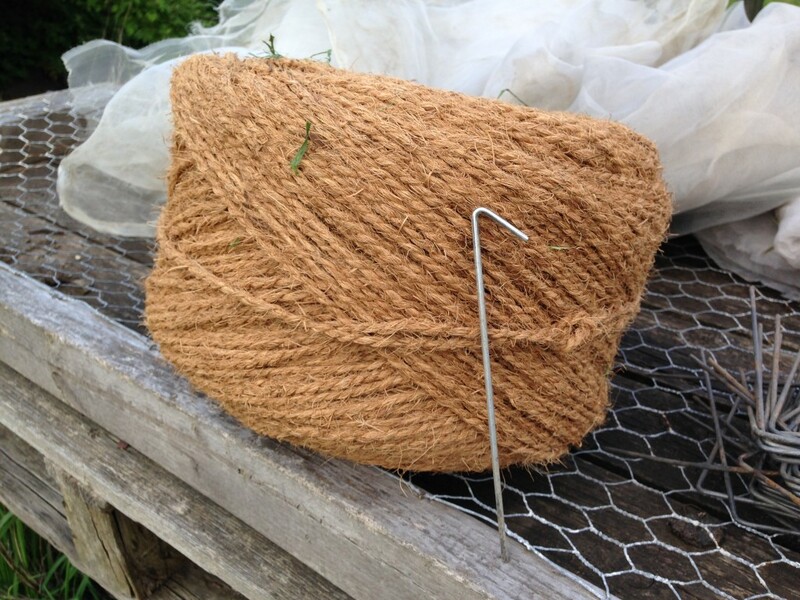 I’m growing my annuals through netting this year for a bit of support; in a week or two I’ll plant out the cosmos and calendula for this year’s cutting patch. 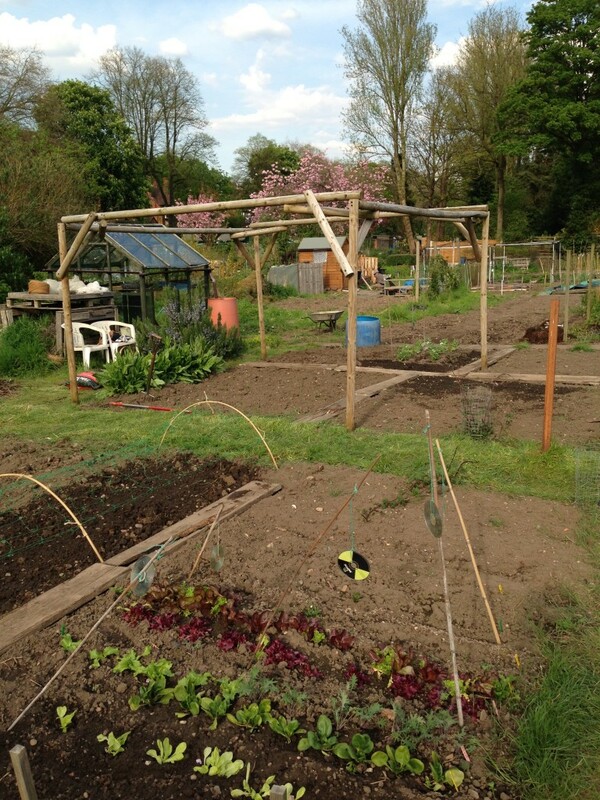 We’ve moved the fruit frame to the main veg patch for this year’s cunning plan: climbing squash! 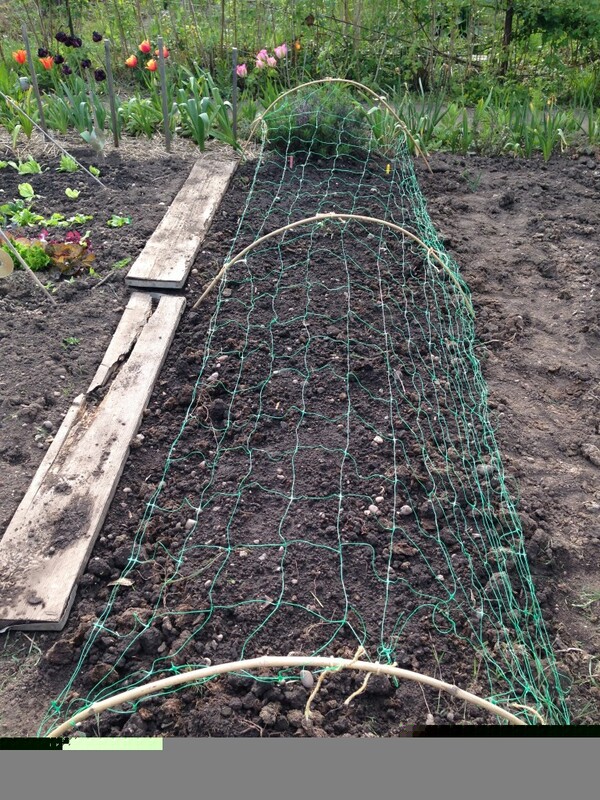 I have three climbing courgette plants and will plant one against each leg of the frame, hoping that the long squash fruits will get to the top and then hang down from the horizontal bars. This may be something I live to regret (I am certain to be bashed in the face by a courgette more than once) but at the moment this plan seems great fun. 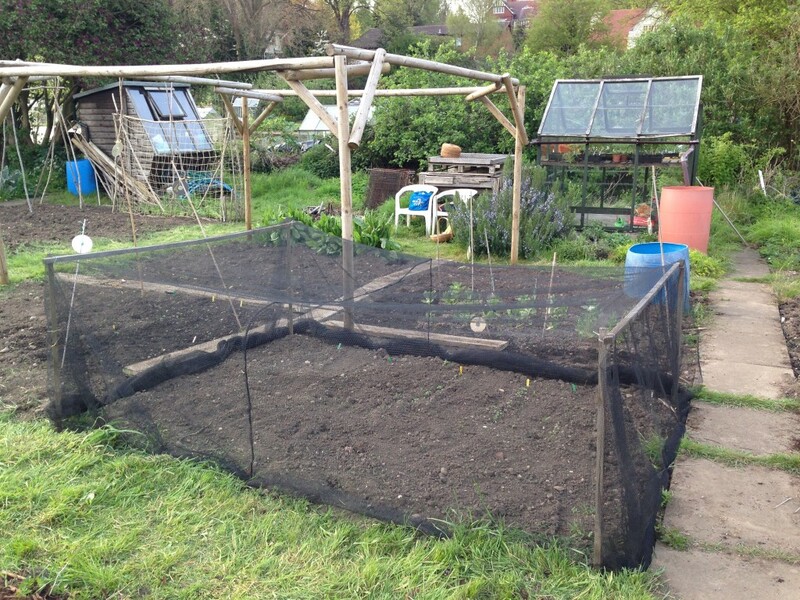 In a bid to keep the pigeons out, we’ve netted the brassica seedlings and those baby lettuces. With a few hours work (and a little sunburn) we have the bones of the 2016 allotment. 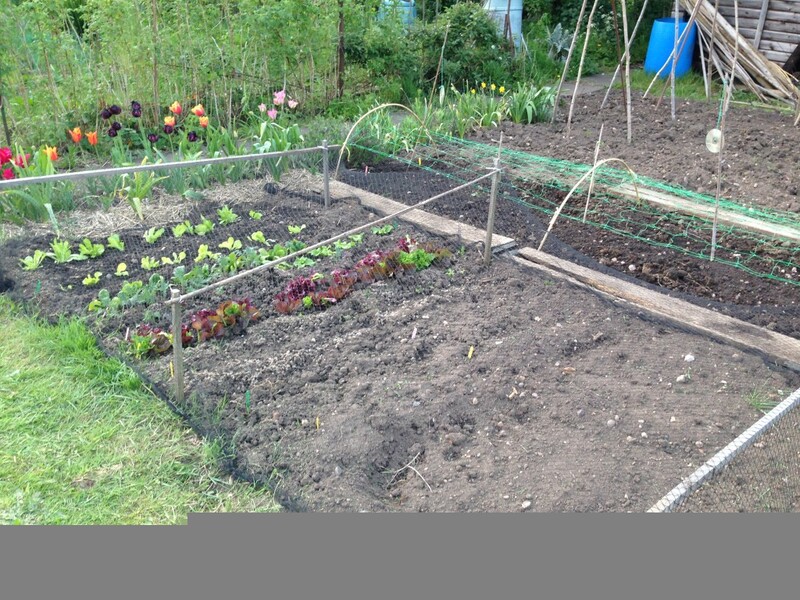 This entry was posted in Allotment, Spring. Bookmark the permalink.